The British Council has issued an apology for a ‘lapse’ that saw it take advantage of Levant Education’s business and collaboration with the FCO in Azerbaijan to launch its own competing offer in the same market. What happens when a UK private enterprise seeks (and pays for) support from the British government in new markets? If that company is in the business of international education, it is likely to find that it has flashed up on the radar of an aggressive, state-funded competitor. In 2012 UK education company Levant Education commissioned support from UKTI, the FCO and the British Council to launch UK-focussed education fairs in Azerbaijan, after successfully launching similar events in Turkey. That support cost Levant Education thousands of pounds for UKTI/FCO facilities (the event reception was hosted at the UK Embassy, where the Ambassador spoke to a specially invited audience) and would go on to cost a lot more. During the ‘independent’ investigation conducted by Verita (paid for by the British Council…) in London, British Council staff admitted that they had been under pressure to identify ways to increase revenue and make more money in 2012, as the government grant was being cut. That drive to be more commercially aggressive is what undoubtedly pushed BC staff to abuse its FCO status in Azerbaijan to gain unfair competitive advantage, going into direct competition with a private enterprise that had both paid the FCO for its assistance, and secured a promise of non-competition from the British Council Regional Director, Helen Silvestre. British Council SIEM (Services for International Education Marketing) products – exhibitions, market reports, online marketing – were launched in Azerbaijan in 2013, following Levant Education’s first successful exhibition. The British Council is seen as a government office, an FCO agency, and a charity – useful branding and cover for its lucrative commercial operations that generate £1 billion every year, tax-free, from IELTS testing, English teaching, Education Marketing and education related contracts. The Verita investigation uncovered incredible duplicity from British Council staff in Baku and Istanbul. While working with Levant Education on its new project, in apparent harmony and good humour, they were simultaneously working to duplicate the event and sell the idea to UK universities and education providers. The British Council’s recently introduced ‘Independent Complaints Process’ has failed its first test since a critical Foreign & Commonwealth Office Triennial Review highlighted competition and accountability issues in 2014. The Council has half-heartedly apologised for its blatant hijacking of our business in Azerbaijan. However the Verita investigation report was carried out as a paid-for service for the British Council, covering up more than it revealed. The final report skates over unfair competition issues, provides for no accountability for Management decisions taken in Istanbul and Baku, and goes to great lengths to ‘blame the victim’ – bizarrely finding that Levant Education was in some way to blame because it later dared to publicly complain about the BC’s dishonest behaviour. The report also fails to address the financial impact on Levant Education: between money invested in the project, fees to UKTI/the FCO, and lost earnings due the unfair state competition, Levant has lost a six figure sum after making the mistake of trusting the FCO, UKTI and British Council. Levant Education will be seeking a review from the parliamentary ombudsman, and seeking legal advice also. A genuine investigation needs to be conducted by an independent body, rather than a paid-for public relations service on behalf of the government agency. The British Council should not be allowed to compete for competitive commercial services while disguised as a government agency/FCO department/charitable concern. The BC’s actions in Azerbaijan, and in Turkey (where it also ignored promises made in regards to fair competition) were dishonest, anti-competitive and devious. The apology is a start, but once again the British Council has been shown to be more concerned about commercial gain and face-saving PR than about accountability, transparency or fair competition. It’s nearly 2 years since a Foreign & Commonwealth report, following a root and branch Triennial Review concluded that their were serious concerns around commercial accountability, financial transparency, conflicts of interest and fair competition with the private sector. Since the review the British Council has made efforts to improve transparency, stating on its website that it is ‘fully committed to transparency in our decision-making processes, how we work and the programmes and services we provide. Transparency is an important aspect of the British Council’s accountability to the UK public, Parliament and the people who participate in our programmes and projects‘. Information in this section has been redacted/removed as it is likely to be exempt from disclosure on the grounds that it is “likely to prejudice the effective conduct of public affairs” as defined in Section 36 (Prejudice to the effective conduct of public affairs) of the Freedom of Information Act 2000*. The Board approved a resolution to authorise the British Council’s branch in Hong Kong to register with the Macau Tax Department. The resolution was proposed by Usha Prashar and seconded by Gareth Bullock. Information in this section has been redacted/removed as it is likely to be exempt from disclosure on the grounds that it is “likely to prejudice the commercial interests” of either the British Council or another party, as it is defined in Section 43 (Commercial interests) of the Freedom of Information Act 2000*. Report from the Audit CommitteeThe risk reserve had been cut by £4million as the Committee had agreed that risks from tax exposure had been reduced the Global Finance Change Programme was on track:Information in this section has been redacted/removed as it is likely to be exempt from disclosure on the grounds that it is “likely to prejudice the commercial interests” of either the British Council or another party, as it is defined in Section 43 (Commercial interests) of the Freedom of Information Act 2000*. Any other business Information in this section has been redacted/removed as it is likely to be exempt from disclosure on the grounds that it is “likely to prejudice the commercial interests” of either the British Council or another party, as it is defined in Section 43 (Commercial interests) of the Freedom of Information Act 2000*. So, about as transparent as REDACTED then. In the 2014 Triennial Review report about the British Council, another area of concern for the FCO is ‘clarity of purpose’, or conflict of interest in plain English. Creating introductions, connections and business opportunities for UK organisations, social enterprises and businesses, helping them to learn from overseas engagement. UK companies in international education (a sector estimated to be worth $6.3 trillion globally) can turn to ‘UKTI Education’ for assistance. FCO Minister of State, Hugo Swire, points out that the FCO and British Council support UKTI in promoting UK education exports. £100k is about half of what cooperation with UKTI and the British Council has cost Levant Education, one Small Enterprise, since agreeing to work together in 2012. It is also a tiny fraction of the Council’s £1 billion annual income. The British Council earns £100k every hour of every day – £100k is the crumbs that fall from the British Council’s table to the ‘wider international education sector’. What Levant Education and many others* have learnt is this: For UK SME’s and entrepreneurs in international education engaging UKTI to help in international markets, the British Council will indeed step in to ‘support’. If the export project is successful and set to provide a return on investment for the SME, the British Council will then exploit its position to channel those business opportunities for itself, quickly snuffing out competition from the SME that created the project in the first place. Conflict of interest is the nice term for this behaviour… If the British Council is serious about helping to create opportunities for UK businesses, working with UKTI, it must cease to compete with those same UK businesses, for those same business opportunities. It is the experience of those companies represented here that the BC finds it hard to demonstrate any competitive neutrality. The BC, as a supplier of services in its own right, increasingly competes with other UK providers, with the almost inevitable conflict of interest. Although the BC provides the clearest example there is a widespread perception that a number of other grant-funded, quasi government agencies and organisations are also beginning to present market conflicts and issues. These agencies are not competitively neutral and there is no level playing field when it comes to their operations and practice abroad. They significantly increase, especially during competitive procurement, the costs and risks for others both those already participating in as well as those considering and entering the market. These agencies are also perceived to have access to more current information, support and contacts abroad than other non-subsidised, commercial providers. This latter issue has been a long standing complaint common to most providers, and thus far, successive Governments have failed to address or recognise it. Last week top UK Universities returned to Baku with the Studybritish.com Education Tour, held at the JW Absheron Marriott Hotel on April 8 and 9. Despite the devalued Manat and suspended Scholarship Programme, interest in studying in the UK was high and the exhibition was well attended. The group also visited ADA University, and on Friday evening a lively Alumni Reception was held, with over 70 UK Alumni attending. Levant Education continues to be committed to Azerbaijan, working with universities on a variety of levels: networking, alumni events, recruitment events and market analysis. The majority of Levant’s clients use its services to improve brand awareness and direct recruitment, an increasingly important channel for university recruitment to the UK. The Studybritish.com Exhibition and related events will return to Baku in October. The Independent Complaints Body Verita will soon publish its report into the behaviour of the British Council in Azerbaijan in particular. Levant Education agreed cooperation with the British Council to launch UK-focussed events in Azerbaijan and Turkey in 2012, and paid UKTI for support services. The British Council then used that cooperation and support to launch a competing events, despite assurances of support and non-competition. Thank you for following the link and for your support in addressing unfair competition from the government agency / entrepreneurial business known as the British Council. I am compiling the experiences of genuinely entrepreneurial UK companies that have come up against competition from the British Council, while acting as part of the FCO and often presented as a supportive agency for UK companies looking to grow in international markets. In our own example, Levant Education set up UK Education Exhibitions and paid for support from UKTI to enter new markets (Turkey, Azerbaijan and Iraq) which brought in the British Council to ‘assist’. Despite assurances that they would not seek to compete, they ‘cooperated’ with our projects for a short time before setting up carbon-copy exhibitions the following year, in Turkey and Azerbaijan. Only war and financial problems in Kurdistan prevented them from doing the same there. The British Council used its ‘gatekeeper’ and FCO personnel & offices to exploit our business and ultimately compete with massive government-brand advantages the private sector could never match. This is fundamentally an issue of unfair competition and conflict of interest, as has been identified in the 2014 FCO Triennial Review. The stories will be used to create a record of the BC’s unfair and predatorial business practices, and may be used to inspire journalists to investigate the uneven playing field we face in the international education sector. Please keep the stories as concise as possible. They will be added to this website and if used in any other way, we will contact you for approval. Is the British Council ‘Entrepreneurial’? In 1946 George Orwell warned authors against making money from writing propaganda for bodies such as the British Council, deeming such work a waste of creative energy. Nonetheless, in recent times, it seems that those writing propaganda for the Council’s commercial activities have been reading Orwell’s novel ‘Nineteen Eighty Four’. When defending its aggressive commercial plans and arguing for continued grant-in-aid funding from the Foreign & Commonwealth Office (FCO), the British Council has sought praise for its ‘entrepreneurial‘ model of public sector finance. The British Council doesn’t have to worry about start up costs or financing: it is underwritten by the taxpayer to the tune of £160 million per year. It commercially exploits its government branding and facilities, and is largely unaccountable. The British Council is a government agency with a government brand, funded by the Foreign & Commonwealth Office of the United Kingdom, with a related political agenda. The British Council has the instant support of Ambassadors, Consul Generals and UK Trade & Investment (UKTI) offices around the world to support its business, at no cost, to the detriment of fair competition. Any education / training company approaching UKTI/FCO for international assistance will be asked to work with a competing organisation – the British Council. The British Council pays no tax, thanks to its ‘charity‘ status and a complex network of international business entities that makes Starbucks envious. British Council employees (whether working for the public good or on BC cash generating business) benefit from a full Civil Service Pension scheme, paid for by the British taxpayer. The British Council stifles competition by using its government brand, taxpayer funding, tax-avoiding global network of companies, and government FCO privileges to maximise income from its marketing, events and language businesses. Levant Education was started using the private savings of its Director, David Mitchell, after 10 years spent working in International Education marketing. Every project or venture it undertakes must take account of the business risk and customer satisfaction. Levant Education is a British company, working to build a brand based on quality events, marketing & recruitment, and education projects in Turkey, Azerbaijan, Iraq and Iran. It is a private limited company, independent of the UK government, working closely with governments where it is active, for example in Azerbaijan. Levant Education pays UKTI for overseas market introduction services (OMIS), which unavoidably brings-in the British Council team in that market. The British Council then shamelessly goes after our business for itself. Levant Education pays tax in the UK as a registered UK company. Levant Education employs and pays its employees with no state benefits required. Levant Education competes in its sector on a fair and even playing field – one which the British Council distorts and exploits. Charity may well begin at home, but Ministers who bravely encourage others to throw stones at the gilded atriums of charitable enterprise should first take care that they do not themselves live in a house with a massive conservatory hidden round the back. The chancellor called on business leaders to raise their heads “above the parapet” and fight back against charities and others who he said were making arguments against the free market and standing in the way of economic prosperity. Speaking at the Institute of Directors in London, just yards from the British Council HQ at Spring Gardens, Osborne told the annual convention: “You have to get out there and put the business argument, because there are plenty of pressure groups, plenty of trade unions and plenty of charities and the like, that will put the counter view”. “It is, I know, a difficult decision sometimes to put your head above the parapet, but that is the only way we are going to win this argument for an enterprising, business, low-tax economy that delivers prosperity for the people and generations to come. If George Osborne wants an example of a ‘charity’ standing in the way of fair play and economic prosperity, he doesn’t need to look very far… the Foreign Office, his neighbours in Whitehall, have a real corker. Is there a ‘charity’ anywhere in the world that is guiltier of anti-business practices than the British Council, the anachronistic government quango / ‘charity’ that pockets a £180 million annual grant from the UK taxpayer, earns from its education businesses a further £750 million without paying a penny in tax, enjoys free use of government facilities and personnel around the world, and is free to exploit its government status, links, and brand for a tidy almost billion pound income at the expense of genuine British companies who lack such privileges? Levant Education has consistently put its ‘head above the parapet’, and looks forward to the support of Mr Osborne and his pro-business colleagues in the cabinet. We are a prime example of an entrepreneurial company that has seen its seen its business eroded thanks to a taxpayer funded ‘charity’ acting as gatekeeper and supportive government body to begin with, only to then go after that same business without mercy. As long as the government continues to oblige the British Council to be largely self-financing, encouraging it to compete unfairly against UK education providers and education service companies (education marketing firms, publishers, testing companies, language training providers, etc) how can anyone take Mr Osborne seriously when he talks about winning the argument against anti-business, anti- competitive charities? 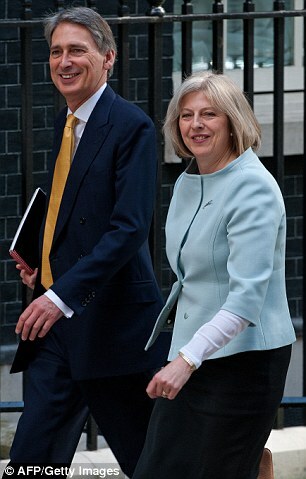 The treasury and the FCO should lead by example before encouraging others to raise their heads above the parapet. The good news is that there is currently a further review being undertaken of the British Council by the Foreign Office, after the FCO Triennial Review Report published earlier this year identified unfair competition, remit mission creep, and lack of accountability issues. 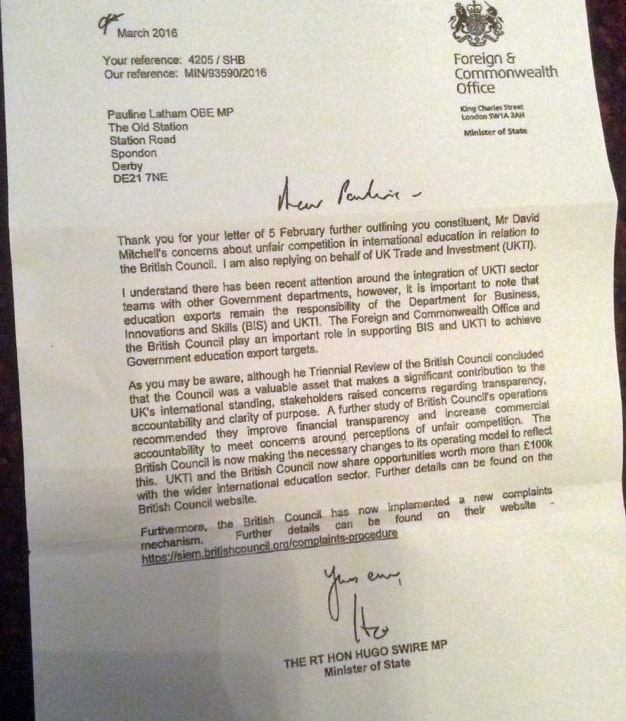 These issues have resulted in a total lack of trust in UKTI or British Embassy/Consulate services in the eyes of education sector businesses, who have engaged with the FCO in good faith, only to lose any gains to the entrepreneurial, but not-so-charitable-after-all, British Council. There is now, therefore, an excellent opportunity for Mr. Osborne and the present government to put its own house in order when it comes to the free market and anti-competitive ‘charities’.